After splashing out on some quality sushi making ingredients, start off by boiling the rice – enough to feed a small Japanese village. 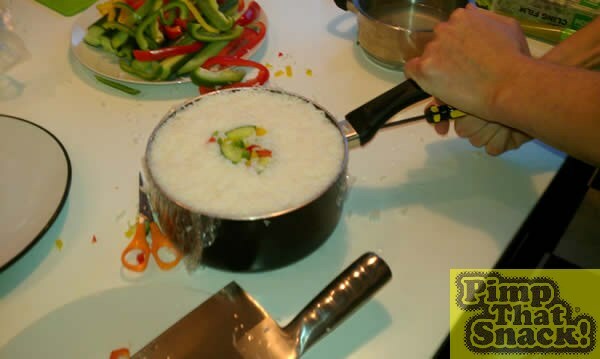 While the rice is cooking, chop the vegetables with the largest knives you can find. Don’t forget to tie the traditional Japanese pillow cases round your head. 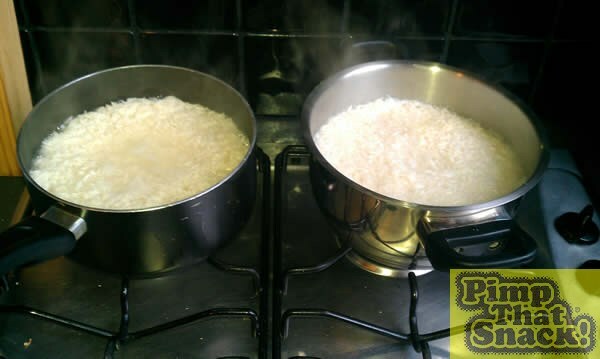 Cook the rice until sticky, cover with clingfilm and leave to cool. 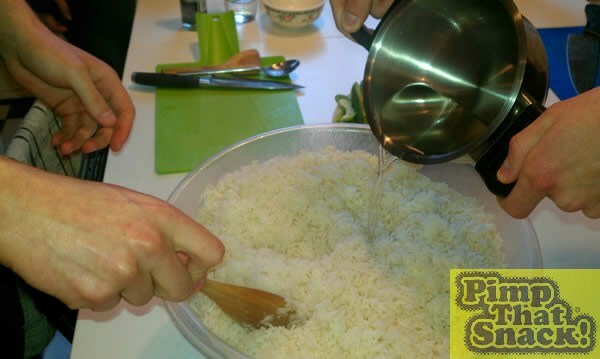 To give the rice the correct consistency cook up some sushi vinegar by heating the vinegar, sugar and salt in a saucepan. 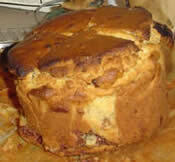 Remove from the heat and add the mirin. Mix the sushi vinegar with the rice. 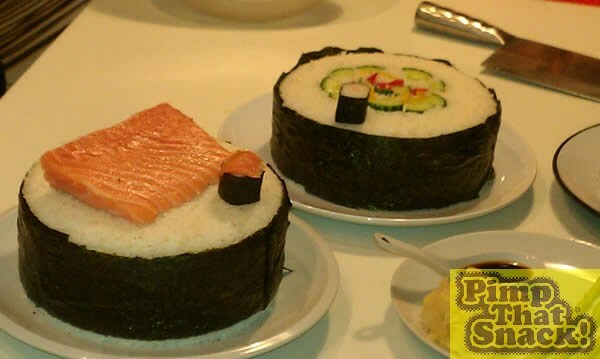 Hopefully the rice should now be sticky enough to build a sushi tower. 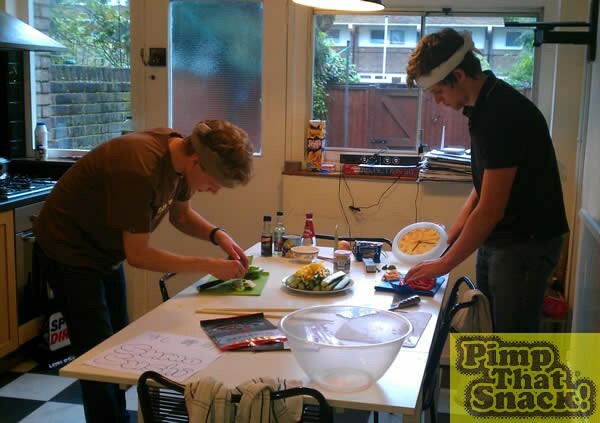 Find a sushi shaped saucepan and line with a single sheet of clingfilm. Start packing in the rice. 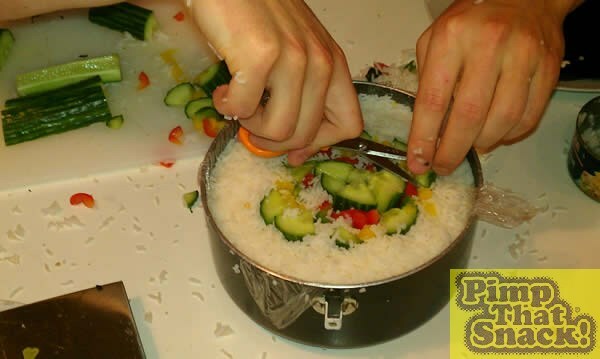 Once the pan is half full with loose rice make a hole in the centre and stuff in the cucumbers, peppers and crab meat. Now keep piling in more rice (I hope you cooked enough). Top up with more delicious crab meat while you’re packing. 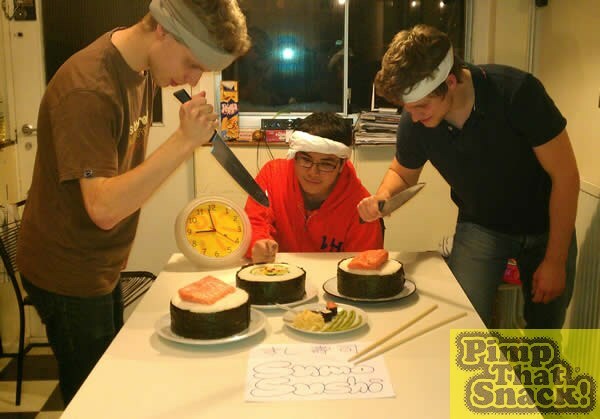 Give the sushi a quick hair cut to make sure it will lay flat on a plate. 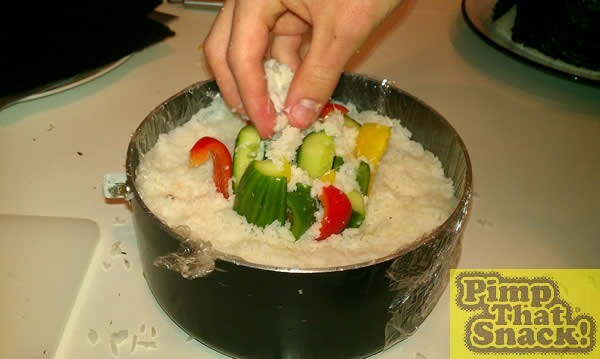 Compress the rice as you go until the pan is full to the brim – imagine you’re on the beach making a sand castle. 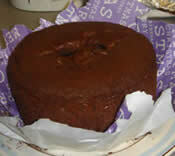 We had to take drastic measures and remove our beloved saucepan’s handle so that we could flip it onto the plate. 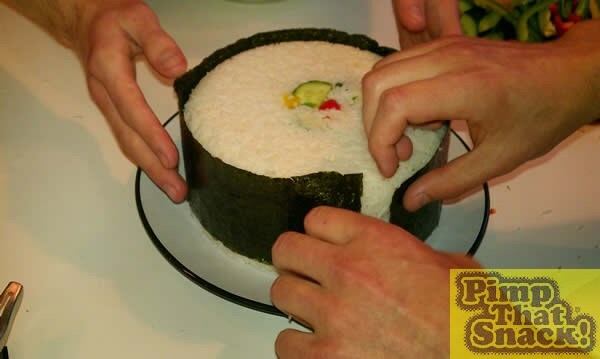 Now flip the sandcastle sushi onto a plate and slowly lift up the pan while your sushi servant holds onto the clingfilm. Cut the Nori into suitably sized strips and piece together into one long ribbon by wetting the ends with your finger. 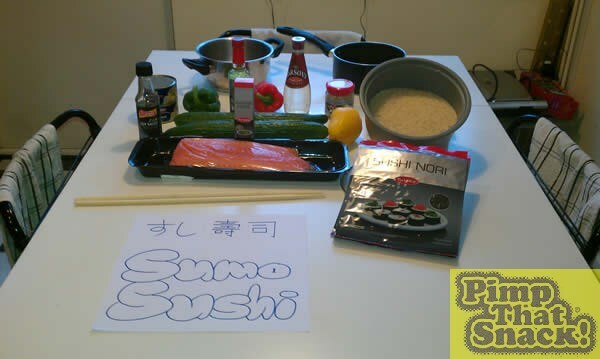 Now wrap up the sushi (not too tight as it will shrink due to moisture) and connect the ends with another dab of water. Top off with a fresh salmon steak. Our Sumo Sushi gave birth to unworthy children. Don’t forget the trimmings – Wasabi, Gari and soy sauce. Certainly a meal worthy of the greatest Sumo wrestler.